About The Hotel You can be sure of finding a warm and friendly welcome from John Crooks and family when you visit the Boar's Head Hotel. This Country hotel of warmth and character dates back to the seventeenth century and is believed to have been a coaching inn. 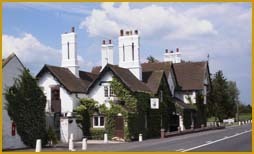 Originally part of the Vernon Estate, The Boar's Head Hotel is reputed to have been lost by one of Lord Vernon's ancestors whilst playing cards! Whether you are here on business or a relaxing weekend away, John, his family and their team of helpful and courteous staff will make every effort to ensure that your visit is as relaxing and enjoyable as possible. The Royal Boar Restaurant The hotel's A La Carte restaurant, "The Royal Boar" makes an elegant setting for any occasion, from an intimate meal for two to a wedding reception for 100 people. Take drinks and view the menu in our Cocktail bar, then after your meal relax with coffee and liqueurs in the lounge. 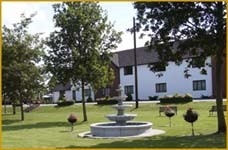 We have available a choice of either a full A La Carte menu or a range of Table d'hote menus. The Hunter's Table Carvery & Bistro The Hunter's Table Carvery & Bistro provides quality good value food in an informal setting. Set in the olde worlde bar there is an extensive selection of home cooked dishes along with a fine selection of traditional ales served every lunchtime and evening. 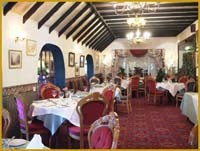 Our Carvery is now famous for it's quality and value. From just Â£3.95 there is home made soup and a selection of roast meats served with fresh vegetables, roast potatoes and all the trimmings.